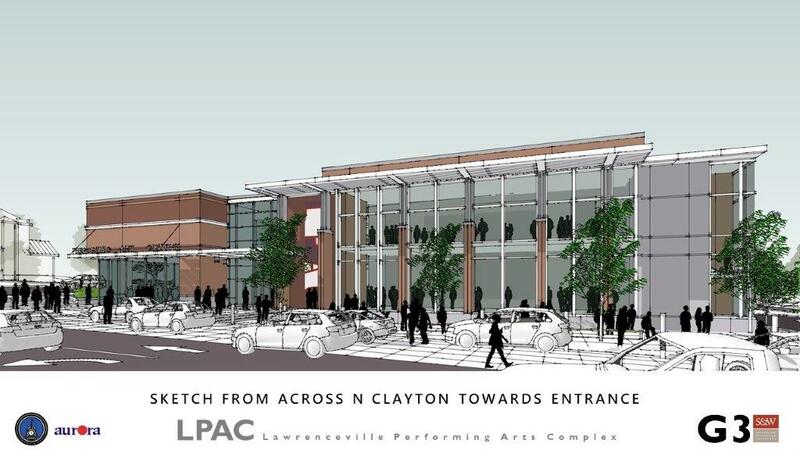 The City of Lawrenceville is getting a new 500-seat theater and an expanded arts and education center. The project is expected to be completed in mid-2020. The City of Lawrenceville Mayor and Council voted unanimously to move forward with plans for an expanded arts and education center in its downtown. Though the City is fronting the investment, fifty percent of the total is planned to come from the City’s arts and educational partners. The expanded facility will include a 500-seat theater, encompass the existing theater facilities managed by the Aurora Theatre and incorporate additional educational space, a cabaret theater, office space and room for complimentary development on the Crogan Street side of the block. This decision furthers the City’s vision to be ‘the college town of tomorrow… where art comes alive in a talent-rich regional epicenter…’ set forth in its new 2040 comprehensive plan. The facility will be constructed on the block surrounded by Pike, Clayton and Crogan Streets with its front entry opening onto Clayton Street across from the Historic Gwinnett County Courthouse Grounds. The Aurora Theatre contracts with the city to manage, operate and craft programming for both its current venue and the future facility being proposed. Though the facility is expected to transform the landscape of downtown, city officials remain dedicated to retaining the historically intrinsic nature of downtown Lawrenceville’s architecture and infrastructure and blending it with a progressive community engagement center. The community provided much needed input on the design and direction of the project and with that input, the city will move forward to begin demo and construction in the next 90 to 120 days. The facility is expected to be complete by mid-2020.